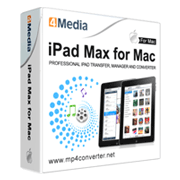 4Media iPad Max for Mac is a must-have tool for Apple iPad and Mac fans to help them backup and transfer movies and audios from iPad to Mac, from Mac to iPad, and from iPad to iTunes. With the iPad converter & transfer for Mac, you can also convert favorite CD/DVD discs to iPad and convert various videos, audios, ISO images and IFO folder to iPad supported files. The input video and audio formats include M2TS, MTS, AVI, MP4, MPEG-4, MPEG, WMV, DAT, TS, MPV, NSV, M4V, MOV, QT, H.261, H.264, MP3, AAC, WMA, AAC, AIF, AIFF, AC3. Moreover, the Mac iPad converter allows you to edit track information, preview videos, DVD movies and audios, and search files. And 4Media iPad Max for Mac now are available for iTunes 10 and all iPad/iPhone/iPod models: iPad Wi-Fi, iPad Wi-Fi+3G, iPad 16GB, iPad 32GB, iPad 64GB, iPhone, iPhone 3G, iPhone 3GS, iPhone 4 and iPod. Copy iPad movies, music and photos to Mac; transfer iPad media files to iTunes using the Mac iPad transfer. iTunes 10 is supported. This iPod manager for mac helps you import your favorite movies and music on Mac to your iPad without iTunes. With the Mac iPad converter, you can watch your treasure DVD movies and enjoy music CD on your iPad by converting CD/DVD discs to iPad supported files. Convert videos, audios, ISO images and IFO folder on your Mac to iPad supported formats and transfer them to iPad. High compatibility with all iPads and other Apple portable products: iPad Wi-Fi, iPad Wi-Fi+3G, iPad 16GB, iPad 32GB, iPad 64GB, iPod, iPhone, iPhone 3G, iPhone 3GS and iPhone 4. Once you connect your iPad to Mac, this Mac iPad manager will recognize your iPad basic information including capacity, type, version, serial number and format. Complete your music file information to well manage, including name, artist, album, composer, and year. Quick search function lets you quickly find the exact file you want, and the filter sorts files by Genre, Album and Artist. The iPad converter for Mac allows you to preview DVD movies, videos and audios with the player which has two aspect ratios: 4:3 and 16:9. Create your own playlists; establish/remove/edit photo albums to your preference; import one photo into several albums for different demands; comment and rate on your music file. Create your own playlists or rename them and write comments for your music file and rate them using this iPad converter for Mac. 4Media iPad Max for Mac supports multiple language interfaces: English, German, French, Traditional Chinese, Simplified Chinese and Japanese. Supports iOS 4.1 and iPhone 4. 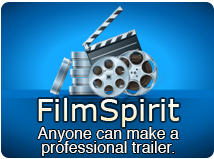 Copyright © 2006-2015 4Media Software Studio. All rights reserved.